Posted June 1, 2016 by admin . 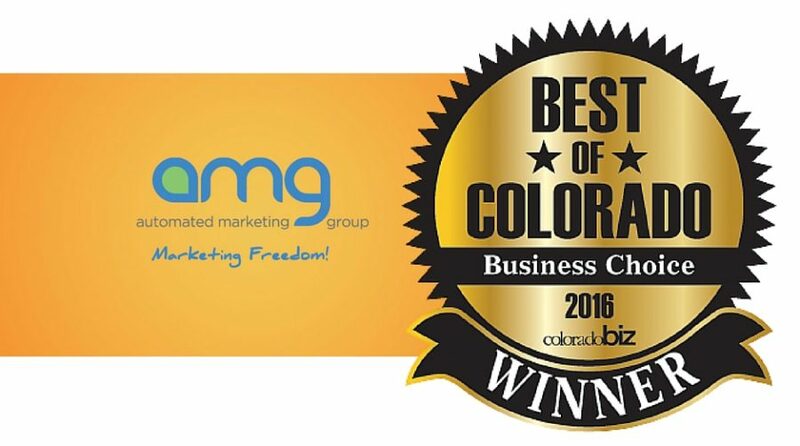 Our team is honored to be named Best Marketing Agency in the “Best of Colorado” Business Choice awards from ColoradoBiz. Learn more in the press release below and catch us in the printed copy of the magazine. Thank you for your support! Clients of Littleton’s Automated Marketing Group, a full-service marketing agency, are raving about the overall experience of working with this team. Taking it a step further, they are also calling them out on their website know-how. As a result of creating marketing campaigns that grow clients’ businesses the right way, readers of ColoradoBiz magazine and business owners in Colordao have voted the agency as the Best Advertising/Marketing Agency, and one of the top website developers in the state. Last year, the agency came in as one of the top three advertising/marketing agencies recognized in the Best of vote. View examples of Automated Marketing Groups work that earned them these awards. Founded in 2001, Automated Marketing Group (AMG) is a full-service marketing agency, and a Google Certified Partner in Search Advertising, offering comprehensive marketing for small businesses from direct mail to social media to web design and more. Request a free marketing evaluation from the award winning experts at Automated Marketing Group.